I realized I haven't blogged in October yet, and I also noticed I hadn't been taking very many pictures lately, so I made a point to do so in the last week. Here's some favorites. After being cooped up in the house all weekend watching conference, we decided to brave the cold weather and go for a walk Sunday. Needless to say, Luke was VERY excited to be outside as well. No matter how cold and windy. Scott taught Luke to fall into pillows and blankets and now he does it on his own whenever there is a big soft blanket layin around. Who doesn't love squishy soft blankets? 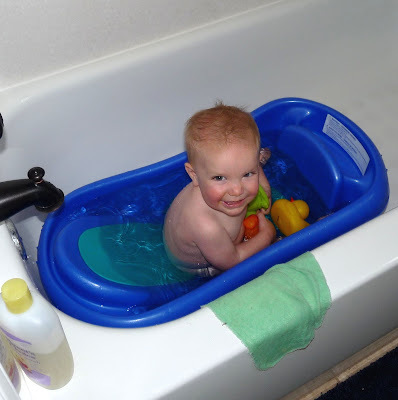 Luckily, Luke's phase of fearing the tub was short--only about 1 1/2 weeks. Whew. Now he is back to his water splashing, duck-squeezing ways. OK. not ALL the time, but today it was. Luke L.O.V.E.S. 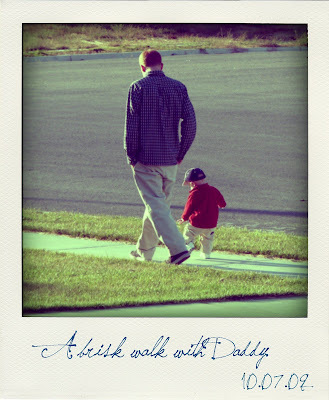 going on walks. Especially when he gets to decide where to go. Even better as a Polaroid. That picture with Scott and Luke walking together from behind is awesome. I just might have to setup something like that with Alexander and myself. 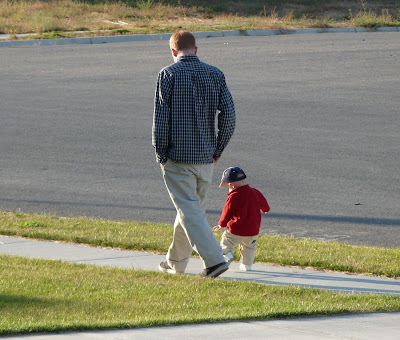 Daddy and son, is a memory keeper forever! We do so much enjoy your Blog; will be better to let you know that. Keep up the good work. Its breathtaking to see the pure happiness on Luke! The Picture with Luke in the blankets looks so comfrey. Can’t believe it's already cold here; send some of that cold our way, it is still so hot here.